Mirissa, a small town on Sri Lanka’s south coast, is a common stop on traveller’s itineraries. The main attraction of the town itself is the numerous whale watching tours on offer – as it’s one of the best places in the world to spot blue whales. Yet there are plenty more things to do in Mirissa, Sri Lanka. Mirissa beach stretches far along the coast and is the perfect place to soak up sun for a day or two. A number of restaurants and bars back onto the beach, so there are plenty of places to watch sunset and enjoy a drink or two come nightfall. For such a small place, there’s everything travellers could possibly want and need. 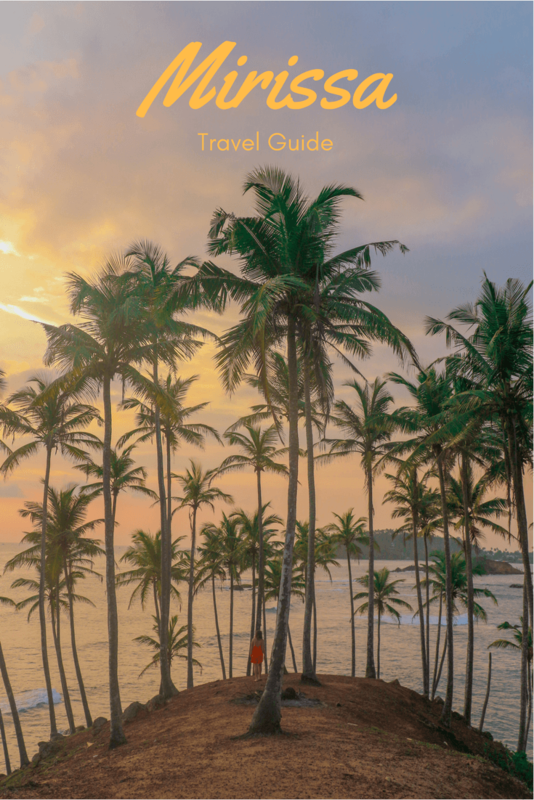 Find out everything you need to know before visiting with this travel guide to Mirissa, Sri Lanka. Save yourself the time and hassle of figuring out what to pack for your trip with this packing guide for Sri Lanka. It covers everything you need to pack to make it the trip of a lifetime! Bus – Buses run regularly to Mirissa from a number of places in Sri Lanka, including Colombo and Tangalle. If no bus is running directly to Mirissa, someone at the station will always be willing to help tell you where to change bus to get there. In Mirissa, buses will drop you off near the beach so you may need to pay for a tuk tuk to your accommodation. Depending on where you’re coming from, the cost of the bus will vary. Fortunately buses are extremely cheap in Sri Lanka so you’ll probably only pay a maximum of around 200 rupees per journey. Unfortunately, some buses don’t allow you on with large backpacks, as they have no storage space, so you may have to wait a bit longer for a bus. It’s also important to note that depending on how long the service has been running you may not be able to get a seat. If you have a long way to go this can be pretty exhausting as the buses can end up very cramped. Train – Trains in Sri Lanka run much less frequently than buses, but in some instances they are quicker. Tickets can be booked in advance but often sell out, so if that’s the case you’ll need to turn up and buy a ticket on the day. From Colombo Fort station to Mirissa a 2nd class ticket costs 220 rupees whereas it’s just 120 rupees for 3rd class. There’s a good chance you won’t get a seat, so make sure to get on as soon as the train arrives to maximise your chances as otherwise you’re in for a long ride! Click here to search for train times and costs from different areas to Mirissa. Some trains run a slower service with longer stops at each station, so try to avoid these if you can! If you plan to travel by train or bus, we recommend reading this guide to public transport in Sri Lanka. Mirissa is a small enough town to reach everywhere on foot. If your accommodation is a bit further out of the way though, there are plenty of tuk tuks available to get you from a to b. If you’re looking to explore some of the surrounding areas then you can rent a scooter or hop on one of the buses passing through the main road. Mirissa’s peak season is between December and March as this is generally the driest time of year in the southern province of Sri Lanka. As the main thing to do in the town itself is enjoy the beach, your options are going to be limited on rainy days. For that reason, you’re definitely best of visiting during this time of year if you can. In particular, January, February and March are the driest months. April and May tend to be the hottest months, but the increase in temperature leads to more rainfall. Outside of January-March, the months with the least rainfall are July and August. 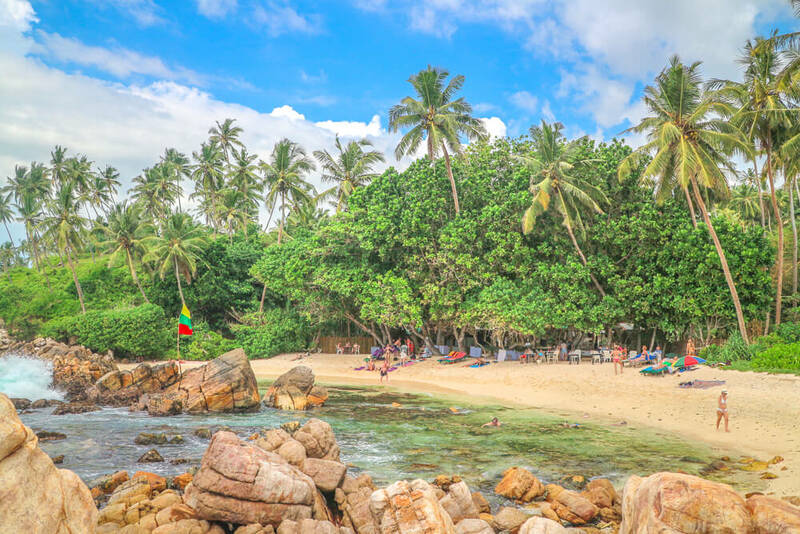 Even if you visit at this time though, the weather can be quite unpredictable in both Mirissa and Sri Lanka as the country has 2 different monsoon seasons. Whale watching – Whale watching in Mirissa, Sri Lanka, is an incredible experience. 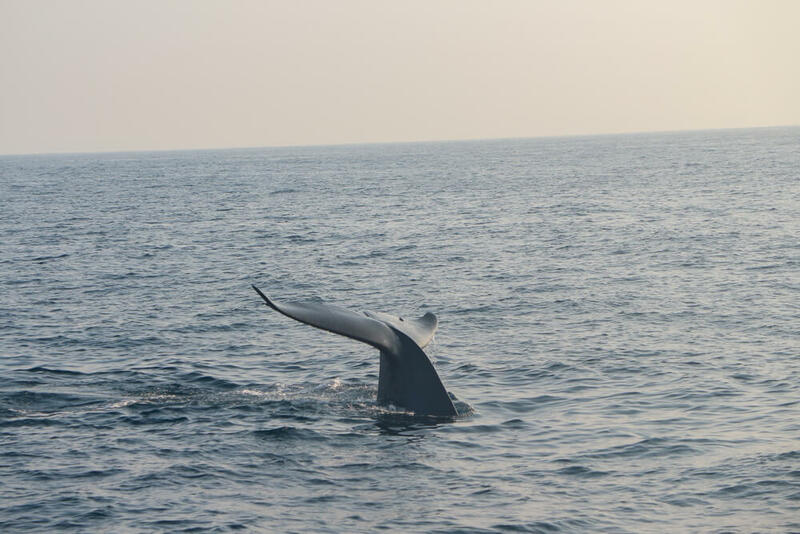 Mirissa is one of the best places in the world to see blue whales, and so whale watching is one of the best things to do in this area of Sri Lanka. The main whale-watching season in Mirissa runs from November to April, with sightings on around 95% of trips during this time. From May to October tours still run, but sightings are less common due to rougher seas. Tours are also more regularly cancelled due to weather during this time. May and June in particular are bad months to go as this is the area’s monsoon season.It’s not just blue whales that are found off the coast of Mirissa though. It’s possible to see an abundance of marine life including dolphins, orcas, sperm whales, whale sharks, turtles and more! Whale watching tours cost around 6000 Rupees per person, but prices do vary between operators. We recommend going with an ethical operator as they take more care around the whales, even if it does end up costing slightly more. Personally we went with the Mirissa whale watching club. They make sure not to overcrowd the whales and keep a reasonable distance, whereas many other operators group together around one whale at a time. Responsible animal tourism is at the top of our list of 13 tips for travelling Sri Lanka, and so we strongly recommend that you check operators reviews online before booking through them. Tours depart early, and so a tuk tuk will be sent to pick you up from your accommodation at around 5.45am. Mirissa whale watching club provided food and drink on board, as well as having a friendly and extremely knowledgeable crew. 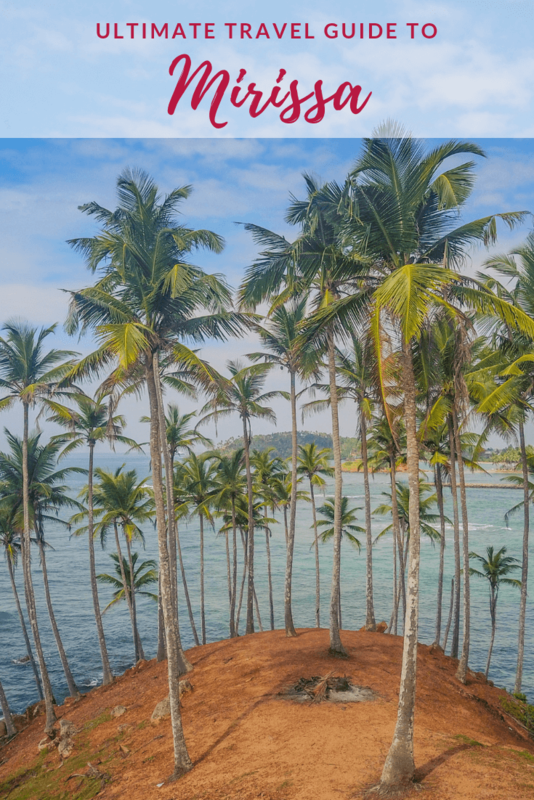 Palm tree grove – The best place to watch sunset in Mirissa is Palm tree grove. Although it’s only approximately a 30-minute walk from the main beach, few people venture here so you may even have the place to yourself. There’s something special about the way the palm trees line up here that make it a beautiful spot to visit. There are 2 ways to reach palm tree grove. Either walk along the main road out of Mirissa town until you reach Maison D’hotes Sanda Beach. From there take the path on your right and you’ll come to a gate, behind which you should be able to walk directly to the palm trees. 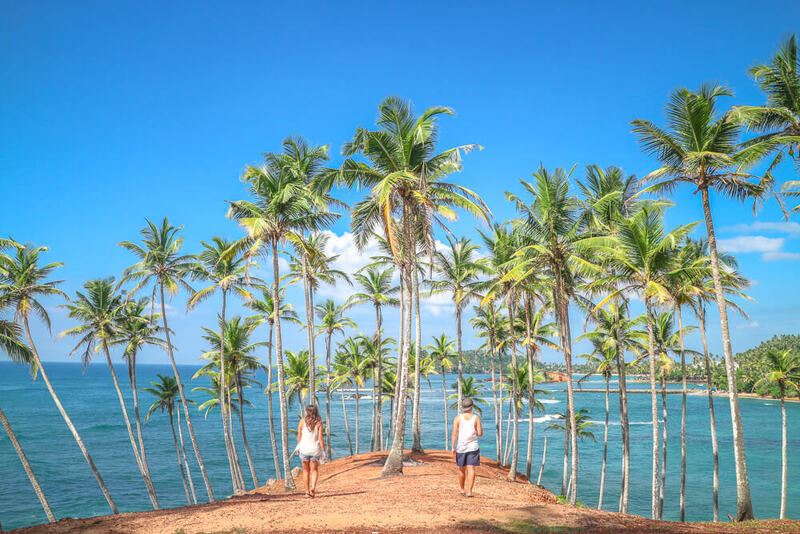 Alternatively, walk from Mirissa beach along the seafront past parrot rock and continue round until you eventually reach the palm trees. Once you’re there you can find a good spot and just enjoy the view! Surfing – Mirissa does have some relatively large waves – good for beginner and intermediate surfers. In particular a lot of surfers seem to gather near palm tree grove to ride the waves. If you’re looking to surf, the locals will be friendly enough to point you in the right direction. 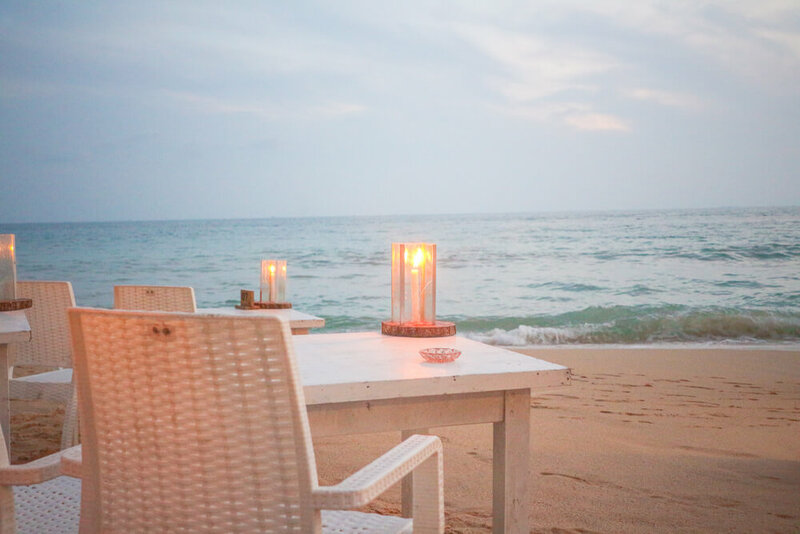 Mirissa beach – Mirissa beach is perfect if you’re looking for a relaxing few days in Sri Lanka. It was one of our favourite beaches in the country, although admittedly we didn’t see too many! You can easily spend a few days enjoying the sun and cooling off in the waters of Mirissa beach. 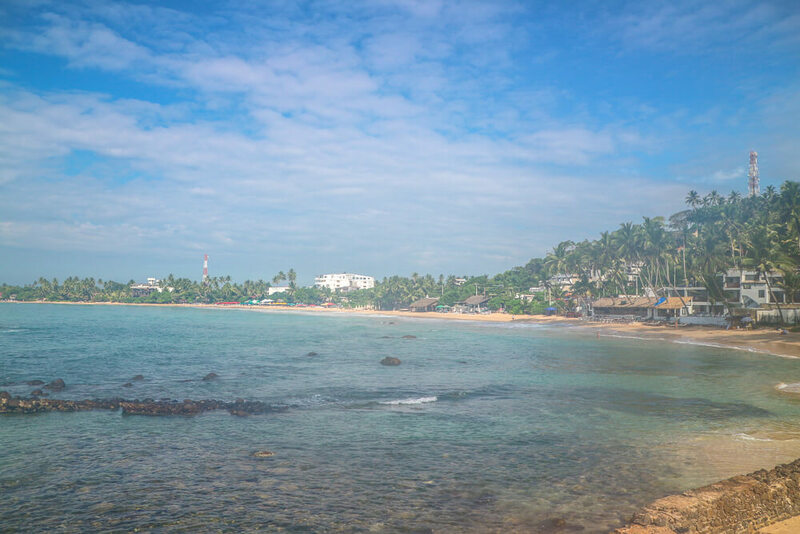 Polhena beach – If you’re hoping to go snorkelling in the area, catch a bus towards Matara and visit Polhena beach. Although the visibility isn’t great, there’s a reef to explore and turtles are regularly spotted here. It’s a great place for a day trip, although try to visit on a weekday, as weekends can be more crowded with locals also heading to the beach! Secret beach – Many travel blogs have documented a secret beach as one of the places to visit in Mirissa. As a result though, it’s not so much of a secret anymore. When we visited the area was quite busy, which we weren’t expecting, although this may be as we visited during the Christmas period. Sadly, the beach is also quite stony both in and out of the water. Personally we were left feeling disappointed with Mirissa’s ‘hidden gem’ and so didn’t spend long there before heading back to the main beach. If you still want to go, the easiest way to reach Secret beach is to use the app maps.me. Search for ‘Secret beach bar’ and it will lead you enough of the way until you start seeing signs directing you. Some local kids may ask you money for directions but don’t feel pressured as you’re fine continuing without doing so. Follow some steps down and you’ll find the secret beach a bit further down the road. There’s a restaurant and bar by the beach if you do plan to spend a relaxing day down there. If you’re sticking to a budget, one of the best options available is the Oasis Hotel Mirissa. For around $25 USD (3800 rupees) per night you can get a double room with air con, while being less than a 10-minute walk to the beach! Click here to see the latest prices at Oasis Hotel Mirissa for your dates! One of Mirissa’s best value options if you’re happy to make do without air con is Nethum Rest. The guest house is run by a friendly family and is just a short walk to both the beach and Dewmini roti shop – one of the best places to eat in Mirissa. Rooms come with a fan and prices start at around $12 USD (1900 rupees) per night. At this price it’s some of the best budget accommodation in Mirissa, Sri Lanka. Click here to see the latest deals at Nethum rest for your trip to Mirissa! If your budget stretches further then another option is Palm Villa Mirissa. With instant access to Mirissa beach, this is one of the best located hotels if you’re looking to spend your days relaxing by the sea. Rooms start from around $50 USD (7,800 rupees) per night. Click here to see the latest prices at Palm Villa Mirissa on Agoda! Should you prefer to have a pool, the Randiya Sea View Hotel is a great alternative. With discounts regularly available, air con rooms can be found starting from as little as $48 USD (7,500 rupees) per night including breakfast. Click here to see the great prices available at Randiya Sea View Hotel! For complete luxury and an incredible pool, book a stay at the Sri Sharavi Beach Villas and Spa. While the property is located just outside of Mirissa town, this means it’s a serene place to relax. Fortunately it’s also just a short 3 minute tuk tuk ride to the town and beach too. You won’t find better than this in the area! We’ve seen discounted rates on Agoda from $132 USD (20,500 rupees) per night, although prices may be higher or lower than this. Click here to take a look at the luxurious Sri Sharavi Beach Villas and Spa and treat yourself to a luxurious stay! Agoda regularly offer discounts on other properties and hotels in Mirissa, Sri Lanka, so click here to see the best deals for your stay! Paragon Resort – One of the many options located on Mirissa’s beach, Paragon resort is a great option for budget travellers. They offer reasonably priced food and happy hour deals between 5pm and 10pm – with cocktails starting at 300 rupees. Meals are nothing to write home about but are decent enough, with a variety of things on the menu as well as fresh fish available. Shady Lane – If you’re looking for a decent breakfast/brunch in Mirissa, then head to Shady Lane. It’s definitely one of the best breakfasts we had in Asia, so we couldn’t help but come back for more. The food and drinks really are delicious, with smoothie bowls available for 600 rupees, toast with toppings (from feta to eggs to mashed avocado) starting at 400 rupees and more! Wadiya – While most beachfront restaurants offer fresh fish, the only one we had chance to try was Wadiya. On that particular day it was the only place we could find that had Mahi Mahi available, which we were extremely keen to have as we rarely get the chance. For 1kg of Mahi Mahi with a side of chips and salad we paid 2000 rupees. The fish was incredible and was freshly cooked – which meant it took about an hour to be served. We could have done with slightly more on the side, but if you’re going then just order a little extra. Dewmini Roti Shop – Rated as the best place to eat in Mirissa on Tripadvisor, Dewmini Roti Shop is another good budget option. Rotis start from 200 rupees, with kottu, curries and more available! Although it’s a bit further away from the beach and the service can be quite slow when busy the food is worth the wait! Zephyr – While the menu is pricey, Zephyr is rated on Tripadvisor as one of the best places to eat in Mirissa. The place is so popular that every time we tried to eat there or make a reservation for dinner it was fully booked (although this was over the Christmas period) – so try to book in advance. The location is great for watching sunset with seating available on the beach. It’s worth noting that some people have complained of poor service, but generally the reviews are positive. Barracuda – Although slightly more expensive than some other options, Barracuda is an option for tasty dishes on the beachfront. In particular the Thai green curry was delicious, although the portion size was a bit small so it’s potentially a better choice for lunch rather than dinner. Like this travel guide to Mirissa, Sri Lanka? Pin it!